2-Ethylhexanoic acid (2-EHA) is a dense, clear, colorless to yellow, high boiloing liquid, with a faint specific odor. It is immiscible with water, but miscible with almost all conventional organic solvents. Stable under normal temperatures and pressures. 2-Ethylhexanoic acid has the potential to biodegrade in soil and in aquatic systems, based on anaerobic and aerobic biodegradation studies. Most of the siccatives are metal salts of the 2-EHA (metal soaps, the ethylexanoates or octoates) which are produced synthetically by an oxo – process. 2-Ethylhexanoic acid part takes oxygen in air and metals act as catalyst to speed up the oxidative coating. The salts are applied as drying agents (siccatives) which have long been used in surface-coating compositions. Siccatives can be based on potassium, iron, lead, zinc or zirconium. Cobalt, copper, molybden, manganese, chromium and nickel (in salts of 2-ethylhexanoic acid) are also important catalysts in several nonpolar substance mixtures. The sodium salt of 2-ethylhexanoic acid, in mixture with other fungicides, is an active ingredient in wood preservative agent. Organic Acid Technology or OAT's are ethylene glycol coolants that are formulated without the use of silicates. Since silicates have a short life, removing them allows a longer service life. 2-ethylhexanoic acid (2-EHA) is one of the common components to OAT coolants which is a corrosion inhibitors, used instead of silicates. The 2-ethylhexanoic acid makes it possible to solve polar metals in oil and other nonpolar substances and preparations. The function in plastic is as a stabiliser and is based on barium, cadmium, tin or strontium. Despite the low thermal stability of PVC, processing at elevated temperatures is possible by adding specific heat stabilizers that stop the damage. During thermal stress on the PVC the EHA-salts intercept the arising hydrochloride. This acid can act as thermal and color stabilizers to alkyd resins. 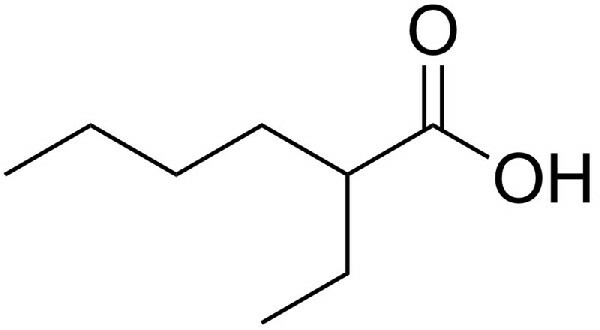 Metal derivatives of 2-ethylhexanoic acid are used as plasticizers for polymers. 2-Ethylhexanoic acid esters, especially those obtained from di-glycols, tri-glycols and polyethelene glycol, besides its lubricant properties, are also excellent plasticizers to PVC, nitrocellulose, chlorinated rubber and propylene. 2-EHA delivers excellent hydrolytic stability for developing emollients. Multifunctional UV absorbers can be prepared from 2-EHA, functional moieties and a polyalcohol core such as Penta. Usage in many low molecular weight aromatic and aliphatic esters. Production of the Highly Acylated Protein Fatty Acid Condensates which are emulsifiers.